Air strikes on Libya "so far very effective"
The U.S. and European nations pounded Muammar Qaddafi's forces and air defenses with cruise missiles and airstrikes, launching the broadest international military effort since the Iraq war in support of an uprising that had seemed on the verge of defeat. Libyan state TV claimed 48 people had been killed in the attacks, but the report could not be independently verified. The longtime Libyan leader vowed Saturday to defend his country from what he called "crusader aggression" and warned the involvement of international forces will subject the Mediterranean and North African region to danger and put civilians at risk. Also joining the attack: Harriers from the 26th Marine Expeditionary Unit aboard the USS Kearsage. The strikes, which were aimed at enforcing a U.N.-mandated no-fly zone, were a sharp escalation in the international effort to stop Qaddafi after weeks of pleading by the rebels who have seen early gains reversed as the regime unleashed the full force of its superior air power and weaponry. CBS News national security correspondent David Martin says the cruise missile attack, followed up overnight by a long range raid by B-2 Stealth bombers flying out of the United States, which bombed a major Libyan airfield. Martin says a no-fly zone is effectively in place, and it is now safe for coalition jets to patrol overhead. Appearing on CBS' "Face the Nation" Sunday morning, Admiral Mike Mullen, chairman of the Joint Chiefs of Staff, said that air strikes in Libya had been "so far very effective" but that "it's difficult to know" what would happen to Qaddafi in the coming weeks. "He's a thug, he's a cagey guy, he's a survivor," Mullen told CBS' Bob Schieffer. "We know that. So it's difficult to know exactly how this comes out, but in the immediate future we're very focused on protecting, providing the environment in which the Libyan civilians cannot be massacred by him and that there can be humanitarian relief and particularly in and around Benghazi." Mullen: Qaddafi's future "difficult to know"
Reporting from Benghazi, CBS News correspondent Mandy Clark said government forces have pulled back from the rebel-held city since French fighter jets began patrolling the skies. The majority of Qaddafi's forces are well outside the city, but a handful of rogue elements managed to get inside. Gaddafi loyalists were shooting at civilians from one vehicle when a motorist shot back and killed them. Rebels later torched it. People in Benghazi are grateful for the U.N. air support, and believe they can take care of Gaddafi's forces inside the city on their own. About 20 French fighter jets carried out "several strikes" earlier Saturday, military spokesman Thierry Burkhard told The Associated Press. He said earlier that one of the planes had fired the first shot against a Libyan military vehicle. Although the no-fly zone was supported by Arab nations - and would not have won United nations backing with them - the head of the Arab League criticized the international coalition's strikes on Libya, saying they caused civilian deaths. Amr Moussa said the military operations have gone beyond what the Arab League backed. He told reporters Sunday that "what happened differs from the no-fly zone objectives." He says "what we want is civilians' protection, not shelling more civilians." Explosions continued to rock the coastal cities, including Tripoli, where anti-aircraft guns could be heard firing overnight in Tripoli. The International Committee of the Red Cross said it was "deeply concerned" about civilians' safety and called on all sides "to abide strictly by the rules and principles of international humanitarian law" by distinguishing between civilians and fighters and allowing safe access for humanitarian organizations. Libyan leader promises "a long war," son "surprised"
Muammar Qaddafi, who has ruled Libya for 41 years, said in a telephone call to Libyan state TV that he was opening weapons depots to allow his people to arm themselves in defense. In a phone call to Libyan state television, Qaddafi said he will not let up on the rebellion in the country's east. He said he has opened up the weapons depots to Libyans, and said everyone is armed with "automatic weapons, mortars, bombs." Qaddafi fires back with promise of "a long war"
In an interview with ABC News "This Week" anchor Christiane Amanpour, Saif Qaddafi expressed surprise at the Western coalition attack, and disappointment in the United States' president. "Yesterday we were surprised that you know the Americans and the British and the French attacked Libya, attacked five cities. Terrorized people, and especially children, women, were so afraid yesterday," Saif said. "So it was big surprise that finally President Obama, we thought he was a good man and friend of Arab world, is bombing Libya." He also dismissed any suggestion that his father step down from power. "Step aside? Why?" he said. "Again, there is a big misunderstanding. The whole country is united against the armed militia and the terrorists." While the U.S. was leading the initial onslaught, officials made it clear that America would quickly step back into a supporting role, possibly within days, and shift command to its European and Arab partners. Speaking from Brazil where he was kicking off a five-day Latin America visit, President Barack Obama made clear the U.S. reluctance to take on another war. "This is not an outcome the U.S. or any of our partners sought," Mr. Obama said. But, he said he was convinced it was necessary to save the lives of civilians, particularly in and around the rebel stronghold of Benghazi. He added: "We cannot stand idly by when a tyrant tells his people there will be no mercy." The U.S. has struck Libya before. Former President Reagan launched U.S. airstrikes on Libya in 1986 after a bombing at a Berlin disco  which the U.S. blamed on Libya  that killed three people, including two American soldiers. The airstrikes killed about 100 people in Libya, including Qaddafi's young adopted daughter at his Tripoli compound. Libyan regime official Mohammed al-Zwei said a large number of civilians were injured when several civilian and military sites in the capital, Tripoli, and the nearby city of Misrata were hit. He also reiterated the Libyan allegation that the rebels were linked to al Qaeda. There was no way to independently verify the claims. The rebels said earlier that they had hoped for more, sooner from the international community, after a day when crashing shells shook the buildings of Benghazi and Qaddafi's tanks rumbled through the university campus. "People are disappointed, they haven't seen any action yet. The leadership understands some of the difficulties with procedures but when it comes to procedures versus human lives the choice is clear," said Essam Gheriani, a spokesman for the opposition. "People on the streets are saying where are the international forces? Is the international community waiting for the same crimes to be perpetrated on Benghazi has have been done by Qaddafi in the other cities?" Saturday's emergency meeting in Paris, which included U.N. Secretary-General Ban Ki-moon, Arab League Secretary-General Amr Moussa and the foreign ministers of Jordan, Morocco and the United Arab Emirates, was the largest international military action since the beginning of the Iraq war, launched almost exactly eight years ago. NATO's top decision-making body is set to decide whether the alliance will join in the strikes on Libya. Diplomats said NATO's military planners are due to present final action plans to the North Atlantic Council on Sunday. The body should then decide whether the alliance will join the coalition operation or just provide logistical, intelligence and other support to the nations taking part in the intervention. Several NATO governments have indicated they would not participate in aerial attacks, pointing out that the alliance is already heavily engaged in the war in Afghanistan. 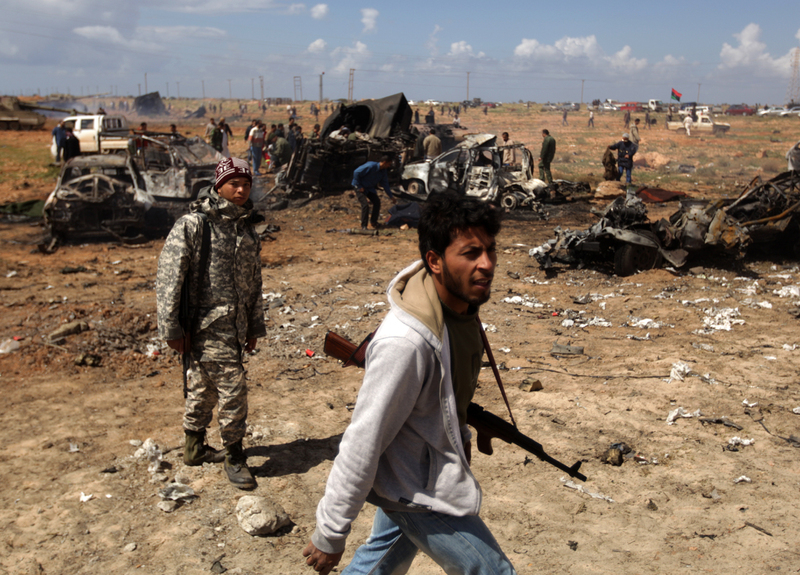 U.S., French and British forces began pounding Libyan targets on Saturday following an emergency summit in Paris. U.S. officials say nearly two dozen targets were struck.